My daughter is growing up fast and so does her feet. I noticed that something is wrong with her left foot lately. It tends to position itself inwards while walking and running. Initially, I want to take her for a consult with a Podiatrist (foot doctor) but when I talked to a friend of mine who visited one, she told me that the brace made for her daughter was bulky and therefore difficult to fit inside an ordinary pair of shoes. What a waste of money if you ask me. In the mean time. she resorted to buying shoes at Dr. Kong for her daughter. My family and I were in Uptown Mall last weekend when we chanced upon a Dr. Kong store. It is a concept store that was first to provide a "Check & Fit" foot examination and insole fitting service, all for FREE. 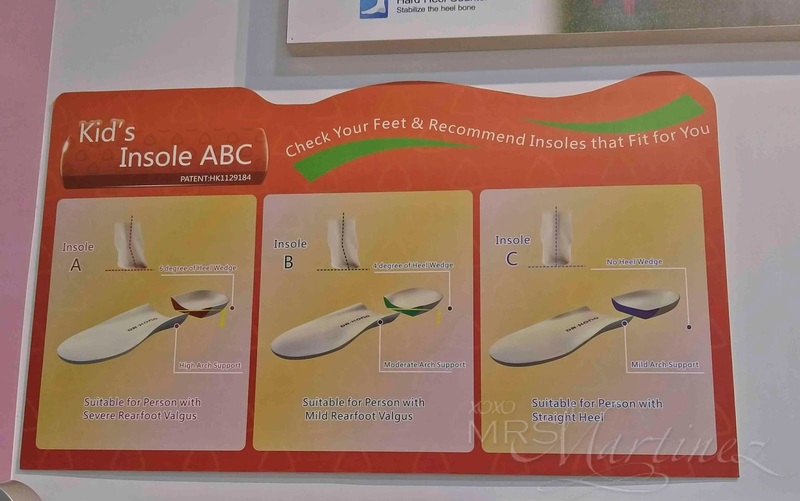 Any staff can help customers select the most appropriate foot care for their foot condition. Aside from that, they also suggest exercise to help with your feet condition. Before buying a pair of school shoes, my daughter had her feet checked for reference. Please note that standing posture, change of weight, foot position while standing and health condition might affect the accuracy. 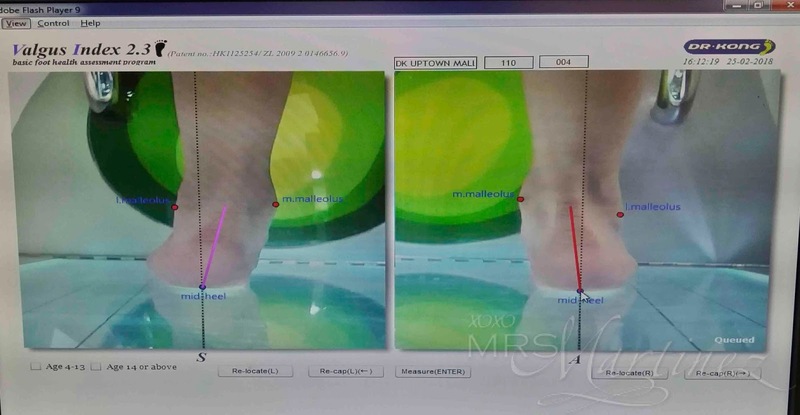 While scanning my daughter's feet for rearfoot valgus, it appears that her heel alignment has SEVERE (left foot) and MILD (right foot) conditions. It is good to note that 84% of rearfoot valgus in children under 14 years of age can be restored to normal range after wearing Dr. Kong healthy shoe and insole. Sam, one of the staff, recommended shoes that have hard heel counter to stabilized her heel bone. All Dr. Kong black school shoes have hard heel counter. Thank goodness! A second test was done to determine her foot arch type. She was asked to bend her knee three (3x) times. The procedure was repeated on her other foot. Afterwards, a sheet of paper was given to us with the imprints of her feet. At the back of the paper, the Foot Care Assistant encircled her foot type as Pronated Flatfoot. It means lower/collapsed arch in standing posture therefore it can be painful and she can get tired easily. The suggestion on the page is to support the arch to reduce stretching on plantar fascia while walking. It is also recommended to shift pressure from medial to lateral. Thankfully, her leg condition is normal. She's does not have knock-knees like me nor she is bow legged like her dad. And now for the good news, Dr. Kong Philippines have a Buy 1 Pair at Regular Price and Get the 2nd Pair at 50% off (equal or lesser value) promo. When Sam mentioned the promo, we took advantage of it. I bought a pair of shoes with 1.5 inch heels so that I can wear comfortable pair of shoes for social gatherings. When you compute it, you get around 20% off from each pair. Promo is until the end of the February 2018. On a side note, DH bought a leather insole for Php 600. He immediately felt the difference when walking. Dr. Kong is located at 3rd Floor, Uptown Mall BGC | For inquiries, please call +632 817 9012 or +63956 477 4845.